This is a sweet little story that's set immediately after Kuya and Yuki's love ending! Or at least it seems that way, based on what Kuya says in here... Anyway! It has a sweet illustration too, so enjoy! This story is #5 of the "coupling short story" series from B's Log. It was during the short break between second and third periods. I was on the way to the chemistry room for my next lesson when I saw Kuya-san through the window. Under the window of the second floor hallway, where I was, he was sitting alone on a bench in the courtyard with Wakasama on his lap, fiddling with his smart phone. His face, with a smile on his lips, looked so happy that it made me embarrassed. What was he doing? Wondering, I was about to call out when my cellphone received an incoming message. An email? The sender was... Kuya-san! Then, was what I saw before him writing me an email? Looking like that? The email was a picture of Wakasama's cute sleeping face and the text "He looks just like you sleeping!" Sleeping.... I guess that was when we fell asleep in my room talking about the culture festival. Back then, I woke up first, but could Kuya-san have woken up again after I fell asleep? And he had seen me? Making that face? When I thought about it, the blood rushed to my face. It was embarrassing, but that wasn't all, it made me really happy. There was an antsy feeling in my chest and I couldn't keep still. I threw open the window and yelled. Kuya-san, who was playing with Wakasama, satisfied after finishing his email, looked up at me in surprise. "Wait right there a bit!" I gave him a big wave, and abandoning my surprised classmates, I ran down the stairs. I glanced at the cellphone in my hand. There were another two minutes until the bell rang. There wasn't much time, but still. I came down the stairs and as I was heading towards the exit, Kuya-san came running up from the opposite direction. He looked worried and I was sure he thought something must have happened to me. I hugged him with all my strength. "Kuya-san, I love you!" I brushed a kiss on Kuya-san's surprised lips and quickly turned around. I was about to run and Kuya-san grabbed my wrist tight. "Wait a minute! What was that just now...."
"We'll continue it later. I have class." With that, Kuya-san ran off, still holding my wrist. His face was bright red probably with embarrassment. But I was sure mine was just as red. I didn't know what to say, so that's what I said, and Kuya-san nodded, looking serious. Pulling my hand, he headed toward the chemistry room. "You're the one who's cute." Saying that put me at a loss for an answer. Then Kuya-san suddenly came to a standstill and knelt in a corner of the hallway. With my arm still caught, I couldn't help kneeling along with him. Our eyes met and Kuya-san said seriously, "Won't you kiss me again?" "Before was the second time that you've kissed me. Still, for me, of all people, the first and second times were too sudden and I didn't properly taste your lips. It's a real, real, real shame...!" "Why!? But I'm asking so seriously!" "But you did it before, didn't you!?" What were we saying, both red-faced, I thought. But. It was different when it was impulsive, but talking about it formally, there was no way I could do it, was there? And, my classmates were in the chemistry room right next door. Class was already starting. Although certainly there was no one in the hallway anymore. Here, probably no one could see. Still, when I thought about kissing, it made it hard to kiss. But Kuya-san looked so serious. "If you won't do it, Yuki, then I will." "What kind of threat is that?" And he lightly pressed his lips to me and immediately pulled away. "Until you kiss me, I'll do it over and over, so prepare yourself!" Even though he said that, with his face bright red, it wasn't much of a threat. But it made my heart tighten more than any threat. 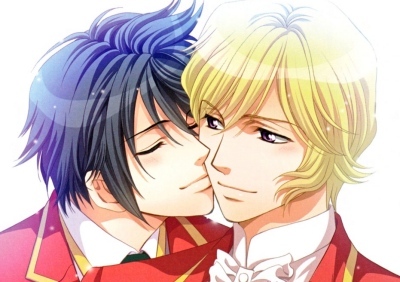 "Then, just one more time...."
Kuya-san was happy and I brought my lips softly to his cheek. First, I lightly kissed his white cheek. Then I pressed my lips just a little, right next to his lips. I glanced up and Kuya-san was looking at me with a gentle gaze. His happiness made my pulse race. He looked so happy because of my kiss. But, at that moment, the bell rang out cruelly. "I'm sorry, I'm out of time!" Kuya-san's cheerful voice chased my receding back. "Let's meet again in the student council room during lunch!" And I waved back at him. See you later in the student council room!